UW kills off the minor penalty and we are back to 5-on-5. 9:34 left in the third and the Badgers are trailing by three. UW is up in shots 27-26. We will have 4-on-4 as the teams get off-setting minors. Back to 5-on-5 hockey with seven minutes to go in the game. 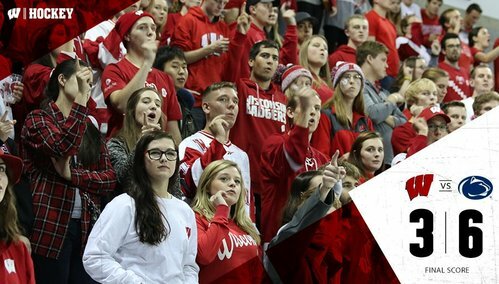 Tonight's attendance at the Kohl Center: 9,314. Freytag-Hughes-Besse out now for UW with 5:02 left in the third. 4:58 left in the third. Penn State leads UW 5-2. Badgers lead in shots on goal 30-28. Big block totals on both sides tonight: 20 for PSU, 16 for UW. Minnesota's 5-4 loss to Ohio State means that UW will stay in a first-place tie with the Gophers if Penn State holds its lead here. Badgers head back to the power play with 4:23 left in the game still trailing 5-2. BADGERS GOAL: Jake Linhart wrists one in from the right point on the power play to cut PSU's lead to 5-3. Berry was just about off ice. Linhart's goal is an extra attacker goal in the live stats. Berry is out for an extra attacker again. PSU called for icing with 1:33 left. NITTANY LIONS GOAL: Zach Saar scores into the empty net from his own zone with 1:25 left. PSU 6-3 over UW. FINAL: No. 10 Penn State beats No. 17 Wisconsin 6-3. UW's winning streak ends at 5. PSU's winless streak ends at 5. 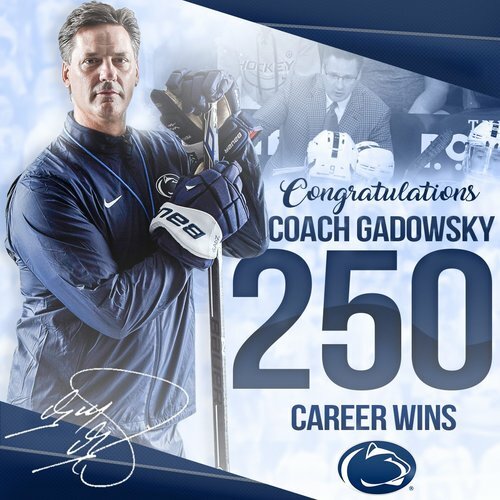 Goodwin scores twice, Gadowsky gets win #250 , Penn State snaps 5-game winless streak with 6-3 victory! Tim Davison said UW was off tonight compared to past. "We were connecting the dots pretty well. And then today, passes weren't as crisp." PSU's Guy Gadowsky said the answer to UW's tying goal was big. "That was a big goal to get a little bit of the momentum back on our side."